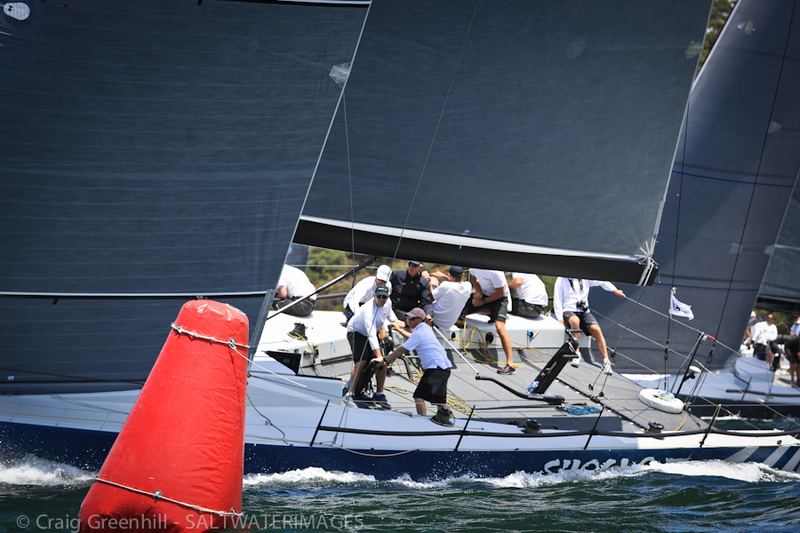 Two bullets and a second capped off Team Beau Geste’s Sydney City Marine TP52 Southern Cross Cup Round Three victory and series hat trick, with one stage remaining. 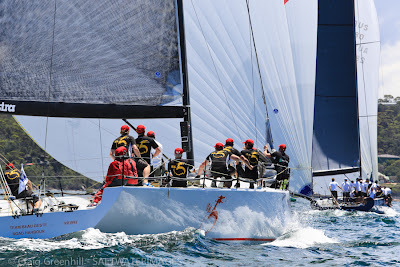 Having experienced four seasons in three days, Sydney put its best foot forward for finals day; cool 10-12 knot sou’east breezes and picture postcard conditions for the deciding three windward/leewards on a short course from Taylors Bay, Mosman to a top mark off Shark Island. Karl Kwok’s Hong Kong registered 52-footer, Team Beau Geste, sailed a quiet and classy series. 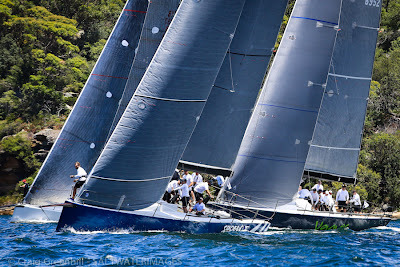 They came to this Sydney round with a cherry-picked mostly Kiwi crew and impeccably prepared boat, strategically picked the nearest TP52 in terms of calibre and made sure that boat was jammed up at the start, then stayed between them and the finish line. For round three Rob Hanna’s Shogun V from Geelong was fair game. 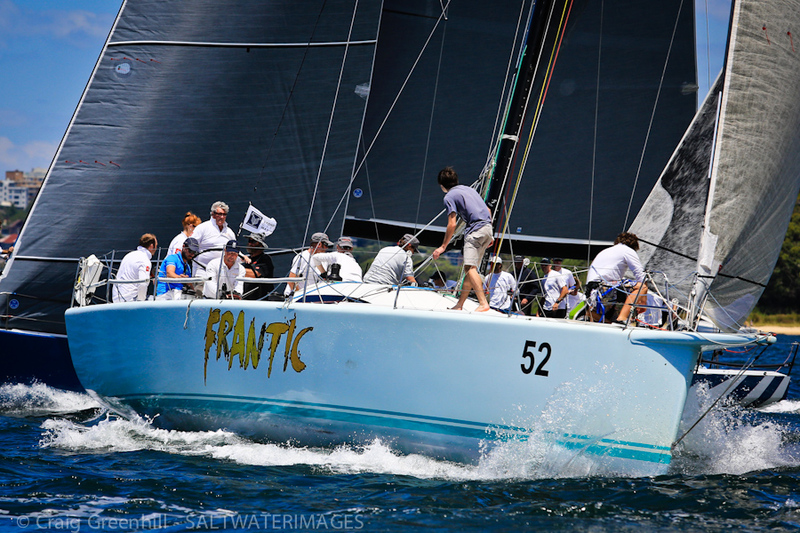 Prior to this edition Marcus Blackmore’s Hooligan, now in transit to a new owner in Newport Rhode Island, was the marked boat. Shogun’s impressive rear-guard of winning America's Cup wing trimmer Kyle Langford, tactician Stu Bannatyne and strategist Ben Lamb wasn’t enough to tackle the might of Brady’s bunch, though they did take two wins off them to finish second overall with 11 points, three points off the gun boat. 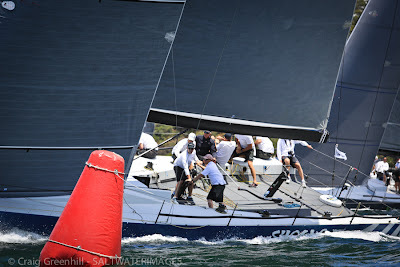 “We knew from the first race Shogun V was going to put up a fight,” said the New Zealand helmsman of Team Beau Geste. On today’s conditions Brady added, “That shifty stuff is awesome; the combination of short courses, flat water and shifts is a great equaliser”. Royal Sydney Yacht Squadron’s Principal Race Officer Rob Ridley shortened the leg length in the final race to just 0.6nm, a move applauded by Brady. Brady says to win the series, with no discards allowed, crews need the platform of a reliable boat. 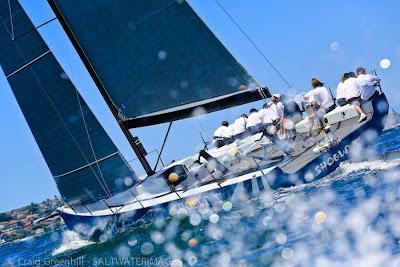 It wasn’t all expensive champagne and back-slapping for the winning crew once berthed at the RSYS this afternoon. Brady plus four of the TBG crew were made to swallow pungent marinated duck eggs, called 100 year-old eggs. Kwok keeps the Chinese delicacy handy to initiate the newcomers on the boat, and for anyone who makes a mistake. 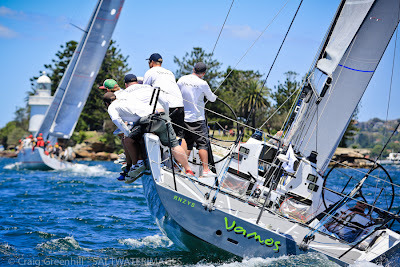 Third overall on 18 points after six races was Connel McLaren’s Vamos (formerly Shogun IV) making its racing and TP52 series debut for the new Kiwi owner. Vamos shone today, Sunday 24th November thanks to snappy crew work and some intelligent calls by tactician Laurie Dury that had them leading the fleet in race four and second at the finish both on line honours and IRC results. “It was important for us to be at this regatta to benchmark against the other crews,” said McLaren. “The highlight for me is always the start and it was cool beating Shogun across the line today in the first race. There was no lane for them, and I didn’t feel obliged to give them room,” he conceded with a smile. On the class camaraderie McLaren had this to say, “All the other crews were really helpful for our first regatta, particularly with the manoeuvres we were struggling with”. PHS winner Mick Martin was voted “MVP” (most valuable player) by TBG crewman Rob Salthouse and Brady. 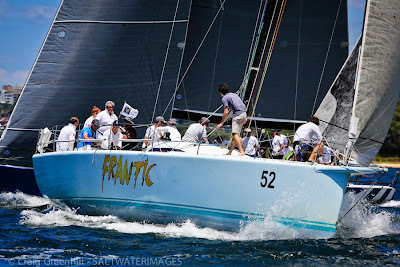 The Corinthian crew on Martin’s Frantic get a real kick out of TP52 class racing when really the boat’s set up for long ocean races. Trophies were presented to the placegetters at the host club and the winning skipper’s weight in Coopers 62 awarded to Kwok before interstate and international crews headed home. 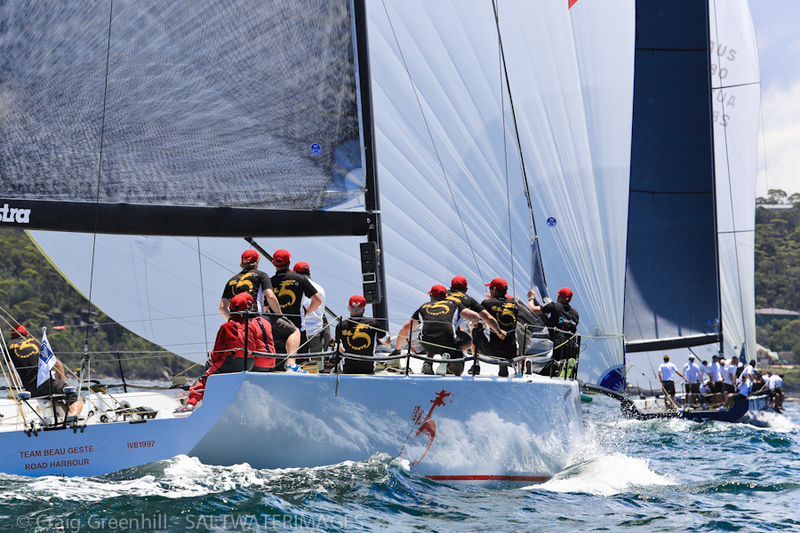 Yesterday it was the gargantuan Perpetual Loyal that caught the eye of TP52 sailors on the harbour, today it was Matt Allen’s glossy Carkeek 60 Ichi Ban, straight out its wrapping paper and readying for this year’s Rolex Sydney Hobart. The closing stage of the inaugural four-part TP52 Southern Cross Cup will be hosted by the Royal Prince Alfred Yacht Club on Sydney’s northern beaches December 13th-15th, 2013. The class is hoping for a boosted final round of up to seven starters.